An overview of the liturgical season known as Easter which is represented by the liturgical color white — the color of light, a symbol of joy, purity and innocence (absolute or restored). He is risen! Alleluia! 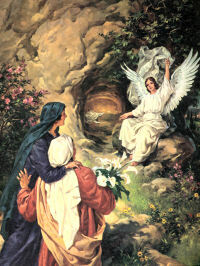 We have reached our goal: Easter, the day we celebrate Christ's resurrection. This is the single most important feast day of the Church. In the words of the Eastern church calendar this is "the sacred and great Sunday of the Pasch, on which we celebrate the life-giving Resurrection of our Lord and God, the Savior Jesus Christ" (Francis X. Weiser, S.J., The Easter Book). 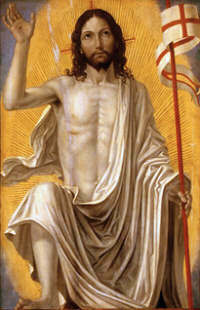 With Christ's death and resurrection, Christ has conquered sin and death, the gates of heaven are now open to man. This is the Feast of Feasts, the Solemnity of Solemnities, the highest Feast of the Church, the holiest day of the year. Like the churches, the household is decorated with numerous flowers, like lilies and hyacinths, and the table decorated with the finest linens and place settings. After 40 days of penance and preparation, we have finally reached our goal. Now is the time for rejoicing. 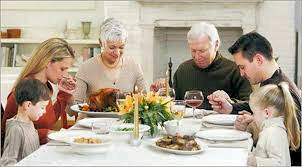 This is a day for family dinner and activities, to practice many already established traditions and to share the joy together with family and friends. The best of everything should be used today: flowers, china, silver and foods. There should be no holding back in the rejoicing! After all the egg decorating, it is fun to search for Easter eggs, outdoors if possible. Incorporate a new tradition of adding a special Alleluia Egg or golden egg. The person who finds this egg wins a special prize, or gets to perform a special coveted task. Easter baskets are an American tradition, full of chocolate bunnies and eggs, jelly beans and marshmallow candies. Originally the Easter baskets were a way to celebrate the end of Lenten penance. 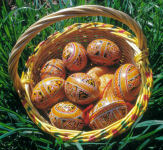 All foods that were forbidden during Lent are placed in the basket and blessed: cheese, butter, eggs, meats and sweets. For those that are sugar conscious, the baskets can also include little toys, books, flowers, religious holycards with pictures of the resurrection, and a few Easter eggs. There should be reminders that this is the feast of the resurrection, and not just a day to "pig out." Easter foods help us to enhance the celebration of the Feast of all feasts. We should make the Easter foods as elegant as we can. Beginning with breakfast, we can serve sliced ham and scrambled eggs and Kulich and sweet butter and bagels. For dinner the traditional Easter lamb along with all the trappings makes this meal stand out from all others. Don't forget to bake one of the many Easter breads that will have your family flocking to the kitchen to see what smells so good. Whatever you choose you can create a tradition in your own family that they will look forward to year after year. At the conclusion of the Easter Vigil, or following the Second Vespers of Easter, a short pious exercise is kept in many places: flowers are blessed and distributed to the faithful as a sign of Easter joy. 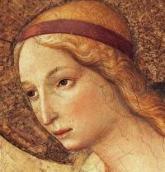 Some are brought to the image of Our Lady of Dolors, which is then crowned, as the Regina Coeli is sung. The faithful, having associated themselves with the sorrows of the Blessed Virgin in the Lord's Passion and Death, now rejoice with her in His resurrection. Not all the family can attend the Easter Vigil due to its time and length. However, It is highly recommended that the family members renew their baptismal vows and sprinkle themselves with the Easter Water as is performed during the vigil celebration. Everyone's baptismal candles and garments can be put on display on the family altar or as a table centerpiece to remind us of our baptism and commitment to our baptismal vows. 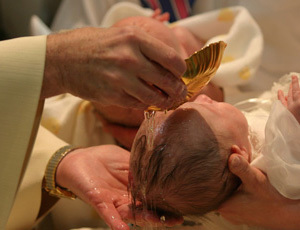 Renewing baptismal promises can also be done at home on the Feast of the Baptism of the Lord in January, and on the anniversaries of baptism. This version is from the Roman Missal, 3rd Edition from 2011. There are many hymns for Easter. 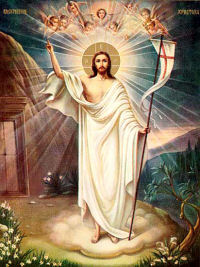 These are just a few: Christ the Lord is Risen Today; O filii and filiae (Ye Sons and Daughters); Regina Coeli; Jesus Christ is Risen Today; Alleluia, the Strife is O'er; Ad regias Agni dapes (At the Lamb's High Feast). These hymns all illustrate the joy of the Church, praising Christ's triumph over the grave. Some of them go back to the 4th century and were written by St. Ambrose, the founder of hymnody in the West. In February 1931 Jesus appeared to a Polish nun, Sr. Faustina Kawalska, and asked that the Sunday after Easter be celebrated as a Feast of Mercy and be preceded by a novena beginning on Good Friday. Jesus promised that those who go to confession and communion on that day will obtain a complete remission of all sin and all punishment due to sin. The novena begins on Good Friday and ends on the Sunday after Easter. 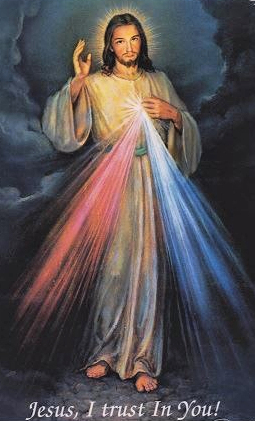 In 2000 Pope John Paul added Divine Mercy Sunday to the calendar as a feast. He canonized Sr. Faustina on April 30, 2000, the Feast of Divine Mercy.